This is an easy healthy snack. Quick and appealing to children and adults alike. You can play with the ingredients depending on your preferences. Palomitas de maiz con Miel, Semillas y Naranja. Melt the honey with the oil or butter and blend with the orange peel and nutmeg. Pour the mixture over the popped corn and seeds. Heat in a baking tin Gas mark 4 for 12″-15″, cool and serve. I usually pop our corn in the machine but popping corn on the stove (it just takes a couple of tbsps of heated oil) is exceptionally amusing for children. We opted for the stove method as this popcorn was especially for my son who, by the way, felt the need to sprinkle a bit of granulated sugar at the end, it didn’t turn out as sweet for his taste I guess. We have tried different seeds, nuts and even dried fruit (chopped dates, apricots raisins, cranberries…) It was equally delicious! You may omit the orange peel or add some other spices instead of the nutmeg. What would you choose? 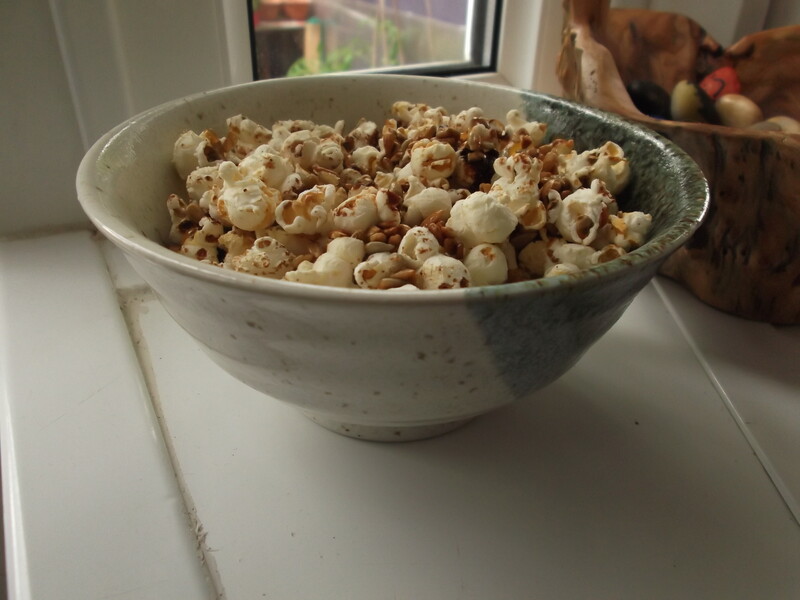 This entry was posted in Of Recipes and Edibles and tagged botana saludable, healthy snack, lunchbox, palomitas de maiz, popcorn recipe by Bodymindsoulparenting. Bookmark the permalink.